This Presentation date is March 8, 2018 at 10:30-12:30 local time. 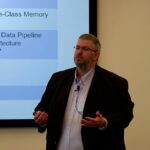 Jeff Baxter, Chief Evangelist, ONTAP, gives an overview of how NetApp is approaching and integrating NVMe and storage-class memory into forthcoming products. Santosh Rao, Senior Technical Director, Workloads and Ecosystem, gives an architectural overview of NetApp’s data pipeline. This begins with a look at legacy architectures, the problems those approaches have this analytics, and how NetApp is expanding the data pine line from the edge, to the core, and ultimately to the cloud. 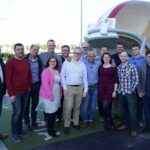 Jeff Baxter, Chief Evangelist, ONTAP, gives a quick overview of the updates to ONTAP in version 9.3. This is designed to optimize and simplify their overall data management. Features include adaptive QoS, 40% faster performance on AFF HA pairs, improved efficiency, and stronger compliance tools.